Have you thought about advertising on the platform? Instagram just began offering paid advertising opportunities through select developer partners. In the coming months the platform is expected to create a Facebook-like self-serve option for any budget. In this article you’ll discover findings from studies about Instagram’s current reach, and the potential to reach targeted audiences with ads. In December 2014, Instagram reported its user base hit 300 million, 64.2 million from the U.S. alone. More exciting to brands and marketers than strict user numbers, however, was the engagement rate. Instagram users like, comment and re-gram at a rate of between 3.1% (Socialbakers research) to 4.2% (Forrester research). 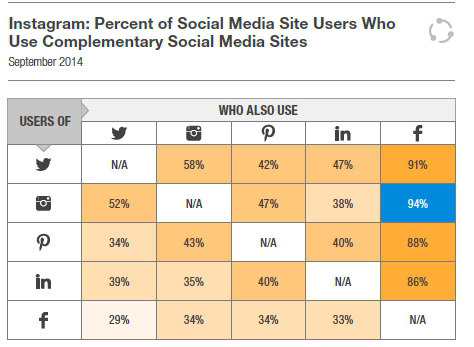 Comparably, Twitter and Facebook posts have engagement rates of .07% and below. 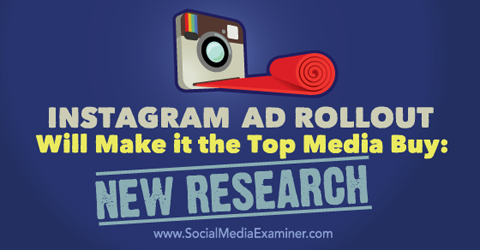 Discover what research shows about Instagram’s ad rollout. With population and engagement numbers like these, of course brands wanted to get access to Instagram audiences. For three years now, Facebook has been working on the correct advertising mix for Instagram. Until June 2015, businesses could only reach Instagram audiences by posting content, commenting, sharing and liking consumer posts. Instagram’s few brand partners could place sponsored posts, much like Facebook’s boosted posts. Strict ads, however, were not available. In June 2015, Instagram rolled out the call-to-action buttons Shop Now, Learn More and Install Now, which take users to mini-apps within Instagram, rather than brand websites. That way, users stay on Instagram once they’ve shopped, learned and installed. Now Instagram has provided advertising opportunities for all brands… provided you enter via one of their developer partners. These partners include Ampush, Brand Networks, 4C, Kenshoo, Nanigans, Salesforce Marketing Cloud, SocialCode and Unified. They require a minimum spend, so if you’re a small business, you won’t be able to take advantage of Instagram’s new advertising opportunities until later in the year. 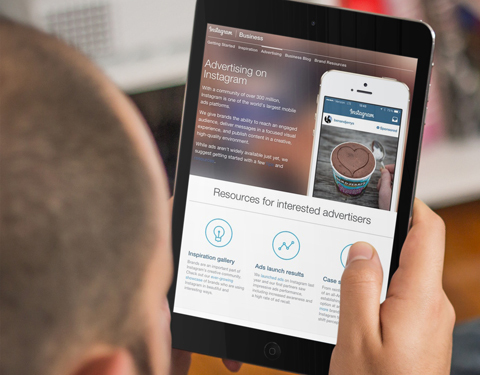 Explore Instagram’s ad platform. Image: Placeit. Facebook’s advertising followed the same path: It offered advertising to certain brands and then eventually made ads user-friendly enough that a developer intermediary was not needed. Instagram ads will be available to advertisers of all types later this year. We are currently testing self-serve buying interfaces and APIs with a small group of partners, and we expect to make them more widely available over the coming months. With the context understood, small- and medium-sized businesses must evaluate whether Instagram is the right place for them. The following research will help with these decisions. Lighting a fire under many marketers, Instagram currently doesn’t have the pay-to-play platform that Facebook instituted in spring 2013. Before that point, companies that had built Facebook audiences had the luxury of getting each post to nearly every earned follower. Facebook then dropped organic reach to 6% and lower, forcing companies to pay to boost posts for as little as $1 per day if they wanted to reach more of their earned audience. Instagram benefits from Facebook data. Image: Shutterstock. Conversely, on Instagram, for the foreseeable future, each post will reach close to 100% of its earned audience… free! Well, free except for the time costs and any costs involved with Instagram’s partners or other outside consulting. When Instagram will go to the Facebook-style pay-to-play platform is unclear. Until that time, you’ll save significant marketing dollars experimenting with which content wins the most attention, engagement and likes. This said, at this time Instagram is only allowing ads through the developer partners mentioned above. Because most small businesses spend less than $500 per month on ALL marketing (and because we expect developer partners to require more than that just for Instagram), smaller shops remain locked out of the platform until the self-serve option becomes available. …management has ensured the mother ship remains relevant by handcuffing Instagram’s targeting and direct-response capabilities to the parent platform. Ad packages across both Facebook and Instagram, leveraging previously eschewed data-sharing practices, are the marketing world’s nuclear fusion. “Nuclear fusion?” Let’s take a look. Instagram has outpaced competitors, and market analysts expect this momentum to continue. Recent research from eMarketer indicates that over the next three years, Instagram will increase its lead on Twitter, Pinterest and Tumblr. By 2019, 33.6% or 111.6 million of U.S. Internet users will be active Instagram users. By that point, Facebook will have leveled off for several years with 52.8% of U.S. Internet users consistently patronizing the platform. 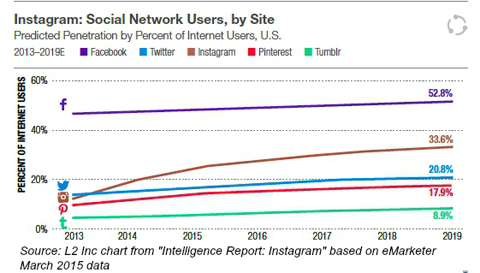 Despite coming onto the scene years later than Tumblr and Twitter, Instagram will become the highest-traffic platform of all except Facebook. Increased advertisement on Instagram will mean more competition for eyeballs, however, and engagement has to fall from today’s levels, taking some of the air from Instagram fans’ balloons. Given the number of users and the access to Facebook data and reporting tools, eMarketer expects Instagram mobile ad revenues to reach $2.39 billion by 2015, a mere 18 months away. While Instagram’s share of U.S. Facebook revenues today make up just 10.7%, that share is projected to nearly triple to 28% by 2017. It’s interesting, too, to note that eMarketer expects Instagram’s mobile ad revenue will outperform even Google’s mobile ad revenue by 2017 by $10 million. Instagram making up nearly one-third of Facebook’s ad revenue will be impressive if it’s actually adding to Facebook’s revenues, rather than just pulling a portion of existing revenue from the parent company. 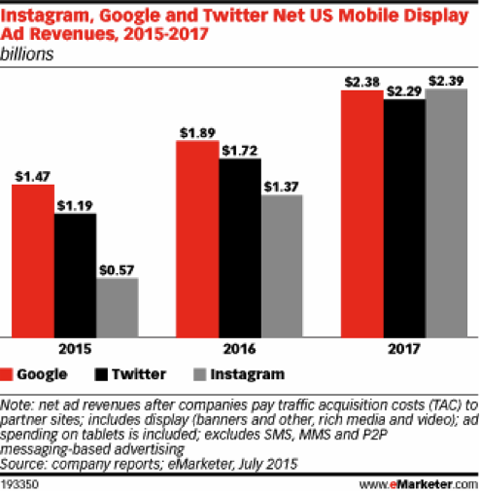 By 2017, Instagram’s mobile ad revenue will beat Google’s, which is amazing considering Google began years before. Now that Instagram is opening up, there is a lot of pent-up demand. The rollout of new features over the next several months means that by the end of 2015, Instagram will have a host of new ad products for advertisers large and small. In particular, Instagram advertisers will be able to use a full slate of Facebook targeting tools, including the popular Custom Audiences feature. That will be a key drawing card. The pent-up demand that Aho Williamson mentions is from retailers, auto, beauty and entertainment companies chomping at the bit to reach the younger Instagram audience. In a 2015 study of 1,597 Internet users from the Pew Research Center, 53% of those users ages 18 to 29 use Instagram. Similarly, eMarketer shared findings from Cowen and Company indicating that where 44% of 18- to 29-year-old U.S. Internet users access Instagram, just 18% of Baby Boomers and 10% of those 60 and older do. 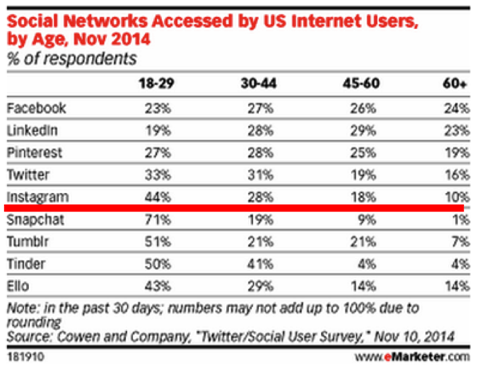 Further, just 23% of those 18- to 29-year-olds use Facebook. Instagram is a domain for young adults. Even in the second half of 2015, Instagram’s careful targeting is still paying off in high engagement rates. Recent data from 100,000 brands analyzed by social analytics firm Shareablee shows that Instagram has three times more customer actions than Facebook and Twitter. Brands saw three times higher engagement on Instagram than they did on their Facebook and Twitter channels. From Q1 2014 to Q1 2015, users increased engagement by 108%, where Twitter’s users increased their actions by 32% and Facebook by 27%. Of course, this has to do with the age of the platforms. Facebook and Twitter already experienced their run-ups to big numbers. As mentioned above, 2014 was the year Instagram caught fire. With Facebook money behind it, Instagram will continue to develop products that appeal to the distinct tastes and habits of the Millennial crowd, as well as the brands that target this audience. With retargeting providing some of the better ROI opportunities, Facebook and Instagram have a unique synergy that shows promise in promoting ad recall and brand awareness. According to Pew Research’s Social Media Update 2014, 94% of those on Instagram also have a Facebook account. That 94% of Instagram users also have Facebook accounts make the two companies ideal for retargeting efforts. Some brands find that using two or more platforms creates better results than one alone. Recently, Instagram targeted users based on Facebook data and then gathered the users’ interaction data with the Instagram ad to place a similar ad on Facebook. Mercedes-Benz got a 54% boost in website visits when advertising on both platforms. In March 2015, Instagram announced carousel ads, which it likens to a multi-page magazine ad that draws consumers deeply into the brand. The four swipe-able images allow businesses to tell more complex stories in pictures. The call-to-action button on the fourth image keeps users on Instagram, however, with an in-app browser containing all relevant information. Therefore, Instagram has yet to create a true direct-response ad, something Facebook did long ago. Some analysts believe that Instagram will use the carousel format to eventually allow users to bounce away from Instagram to a website. As with Twitter, a brand can integrate its Instagram feed into its website. This move not only makes the site more robust and attractive to search engines, but also provides the customer reviews and insights that other buyers trust. L2’s Instagram: User-Generated Content study revealed that 55% of consumers trust customer photos more than slick brand or professional photos. Further, user-generated content syndicated to a website helps marketers recognize the brand advocates who could become brand ambassadors. For example, when Estée Lauder picked Kendall Jenner to become the new face of their brand, their Instagram following leapt 18% in 24 hours. On January 21, 2015, when Estée Lauder and Kendall Jenner posted the same Lauder-generated video, Jenner got 444,000 likes, more than Estée Lauder’s entire following (at the time). Put a different way, Jenner’s post of the identical video won 56 times more user actions than Estée Lauder’s did. When chosen carefully as in this example, brand ambassadors can multiply the amount of reach and engagement. While medium- to large-sized businesses have better opportunities to create Instagram ads through partners Ampush, Brand Networks, 4C, Kenshoo and others, small businesses should be on the lookout for the advent of self-serve Instagram ads that fit into their budgets. If your target audience is in the Millennial or 16 to 29 crowds, reviewing Instagram Marketing: Your Complete Guide to Instagram Success will get you started with the platform. What do you think? Do you plan to work with an Instagram partner to take advantage of this free advertising period? Will you be watching to see when the self-serve tools become available? Let us know in the comments below! Instagram website image created with Placeit. 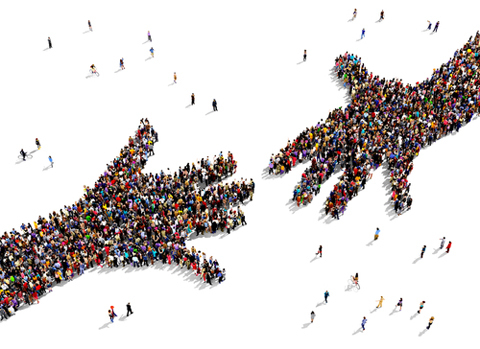 Hand reach photo from Shutterstock. 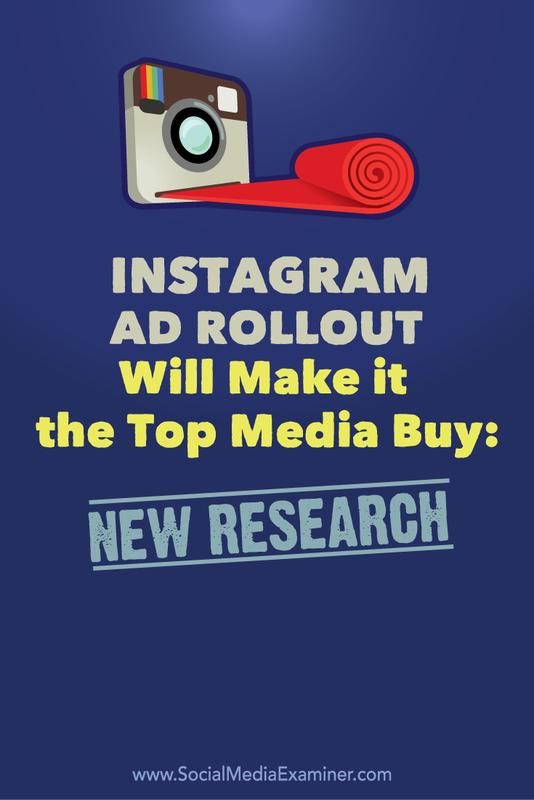 Research showing why Instagram’s ad rollout will make it the top media buy.